In one of the most powerful films in years about one of the most unlikely heroes, 2013's Dallas Buyers Club is the story of power when you have your back to the wall. The film is the biographical drama of cowboy Ron Woodruff who was diagnosed with AIDS in 1985 and given a month to live. Woodruff, portrayed brilliantly by Matthew McConaughey, is a cross between a con artist and rebel who can smooth talk his way in and out of any situation. 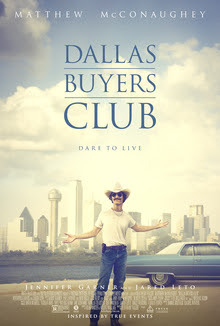 When he finds out he has the virus, he does whatever he can to live longer and along with a business partner named Rayon (Jared Leto in the role of a lifetime), the duo open The Dallas Buyers Club. The club is a membership for people living with AIDS in the Dallas area that they can join for $400 a month and get vitamins and minerals that have not been FDA-sanctioned or approved but have been known to help people live longer with the virus as they are used in other countries like Amsterdam, Mexico, and Japan. Woodruff does whatever he can to take on doctors and big pharma in his quest to make sure his Club doesn't get shut down by the government. The film is heartbreaking, exhilarating, and most of all inspiring as these regular citizens do whatever they can to help those who need it most.